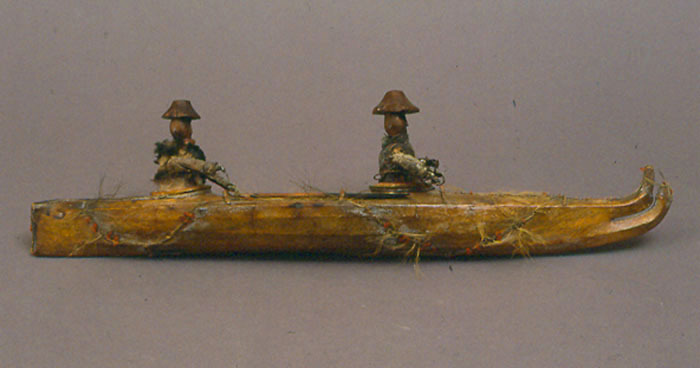 This is a model of a two-man skin-covered boat or kayak with split-end bow typical of the type used by the Pacific Inuit in the western arctic. The frame was made from wood and the seams of the skin cover were sewn with sinew. The seams are decorated with red wool and brown animal hair. Two hunters are seated in the kayak. They are dressed in hide and bird-skin clothing (some feathers intact) and wear brimmed hats fashioned from wood. There are two loose paddles that originally were attached to the hands of the kayakers. Read more about transportation - enter 'transportation' in the search box to your left. Check the Beaver Index - e.g., Eskimo Kayaks, by Ernest Renouf, June 1929. The design of the kayak varied throughout the arctic and it is possible to identify the culture of origin by the shape of the vessel. Full-sized kayaks varied in length from 3 metres to 9 metres;in width from 38cm to 82 cm, and in height from 17 cm to 39 cm. Kayaks were constructed from lightweight wooden frames and usually covered with hides made from sea mammals such as the seal. In some areas, caribou hide was used for the coverings. Wood for the frames was obtained from driftwood, from available stands of timber near the tree line, and, in some cases, from wood available at the trading posts. These watertight seaworthy boats could be moved quickly and were preferred by hunters for travelling in the arctic’s icy waters. Several hide lines were secured over the deck to enable the hunter to carry hunting equipment such as harpoons and lances. Kayakers positioned themselves in the kayak by entering the manholes from the shore, and seated themselves by sliding their legs beneath the deck. They used a double-bladed paddle to propel their kayaks.